Why is London’s Green Belt so important? What are the benefits? There are 218,000 planning permissions yet to be built and swathes of brownfield land which could accommodate at least 300,000 homes in London alone lying idle. Politicians must go beyond making policy statements: they must state how they will ensure Green Belt policies are adhered to and are not undermined. “Brownfield First” needs to become a reality. The liberalised planning system is allowing Green Belt to be released on an unprecedented scale. This is sending the wrong signals and has encouraged a series of Green Belt reviews. Assessments are flawed, they are creating targets much higher than even the government’s need assessments. This is achieving nothing except to open up countryside to housebuilders where they can make more profit. The current approach to growth in the South East simply sustains the North-South divide. Population projections based on past growth need to change. These consign the North to slow growth and put further pressure on London and the South East. Our members are reporting an increasing number of threats to Green Belt land. Councils are conducting Green Belt reviews on a widescale basis signalling a likelihood of even more loss in the near future. But the evidence shows clearly that we do not need to release Green Belt land to build more houses. 218,000 homes in and around London have planning permission but haven’t been built. 111,000 homes in London are waiting to be built. Add to this the 66,800 in the South East and 40,300 in the East of England. 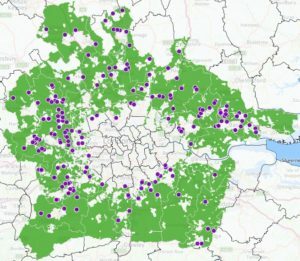 The Further Alterations to the London Plan states that brownfield ‘opportunity areas’ in the capital alone could provide 300,000 new homes. We can plan to build more densely in future to absorb London’s growth. It is possible to do this well with high quality design. Releasing Green Belt land does not increase the rate of build of new homes, it just gives developers more sites to choose from. The problem with allowing permissions on green field land when ‘brownfield’ (previously developed land) is available, is that green land is often more profitable so is likely to be developed ahead of the brownfields sites. Hence we argue for a ‘brownfield first’ approach. The main reason for there being no increase in the number of houses built each year is that it is not in the interests of the housebuilding industry to increase the number of houses on the market as it affects their profitability. The planning system is blamed for planning permissions not being given quickly enough, but the evidence does not bear this out. At the root of the problem of Green Belt sites being released for development are exceptionally high housing targets, based on flawed numbers and a system which pushes councils to make sites available even when there is no likelihood the homes will be built.